The Strategic Forces Command (SFC), fired the long range Agni 3 missile with a range capability of over 3000 kms from Wheelers Island, off the Odisha coast today. The trajectory of the trial was tracked by a battery of sophisticated radars, telemetry observation stations, electro-optic instruments and naval ships from its launch till the missile hit the target area with pin point accuracy. 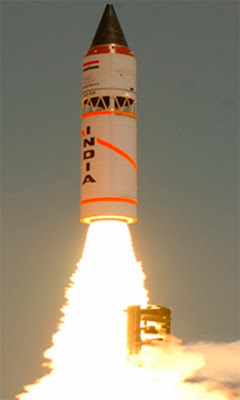 Agni 3 missile is equipped with advanced high accuracy navigation system and guided by an innovative guidance scheme. Quoting an SFC spokesman, “Such successful training launches clearly indicate our operational readiness to meet any eventuality as also establishes the reliability of this deterrent component of India’s Strategic arsenal”.